It’s always exciting to discover a new “favorite food” that’s good for you. 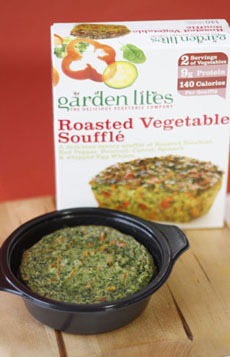 When we received a generous shipment of Garden Lites frozen vegetable soufflés from the manufacturer, we liked them. But as we ate soufflé after veggie soufflé, we grew to really like them. We became so accustomed to eating one a day as a snack or as part of a light lunch, that we laid in a new supply when the original shipment was exhausted. While we relish the vegetable soufflés as casual fare, we wouldn’t hesitate to serve them as a first course at a fancy dinner. Assuming, of course, that we’d be willing to share our stash. The soufflés are made in nine varieties: broccoli, butternut squash, carrot, cauliflower, pizza (cauliflower topped with tomato sauce and mozzarella), roasted vegetable (mixed veggies), southwestern (mixed veggies with southwestern seasonings), spinach and zucchini. There are also two julienned vegetable dishes that satisfy: zucchini marinara and zucchini portabella. Our new favorite snack, first course or light lunch. Photo by Elvira Kalviste | THE NIBBLE. Each single serve is equivalent to two portions of vegetables. Look in your grocer’s freezer case and bring them home: You’re in for a treat! The line is certified kosher. Find more of our favorite vegetable products and recipes.